On 3 July 1898 a US force demolished the Spanish squadron at Santiago, Cuba, in one of the two major naval actions of the Spanish-American War. The Spanish squadron was poorly manned, poorly maintained and out-gunned, so it was an easy victory for the US. Six Spanish ships took part in the action - the armored cruisers Vizcaya, Infanta Maria Teresa, Cristobal Colon and Almirante Oquendo, and the destroyers Furor and Pluton. All these ships were run ashore, except Pluton, which sank. 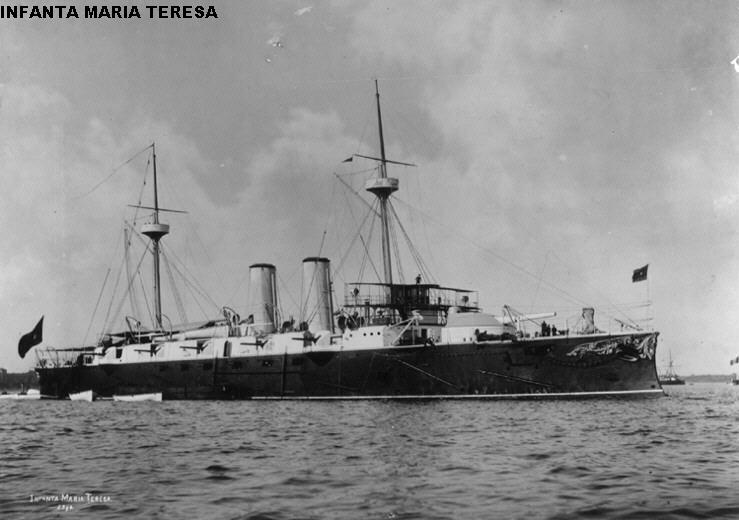 In addition, the Spanish cruiser Reina Mercedes was scuttled in the channel. Because many of the ships were beached, we have this unusual chance to view the ruined hulks of the Spanish ships. 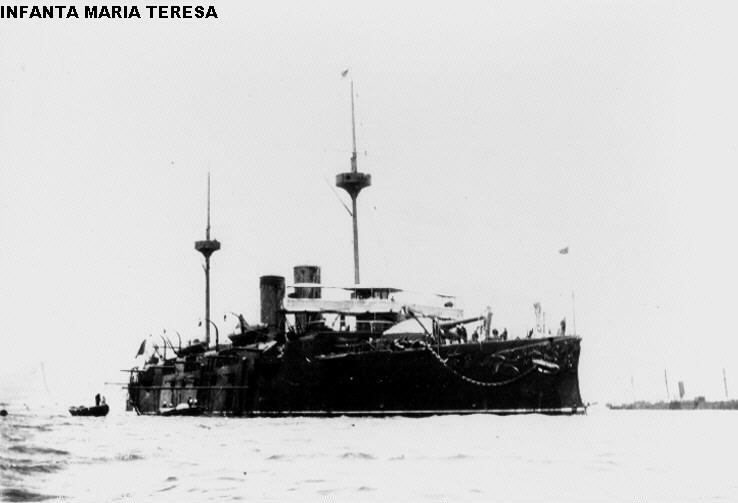 The armored cruisers Vizcaya, Infanta Maria Teresa and Almirante Oquendo were sisterships. Each ship carried two 11" guns, but they were lightly armored. All three were lost at Santiago. 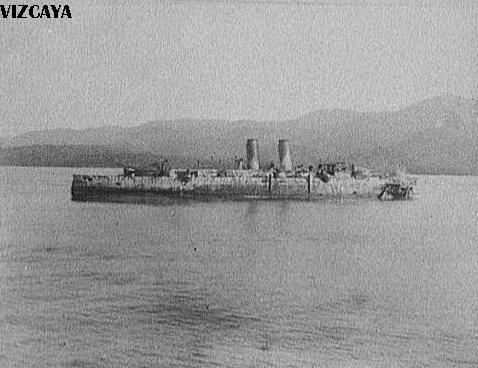 Vizcaya prior to the war. 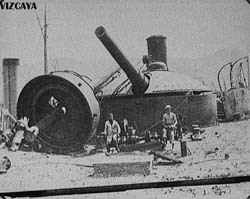 The 11" guns were housed in two single turrets, one forward and one aft. 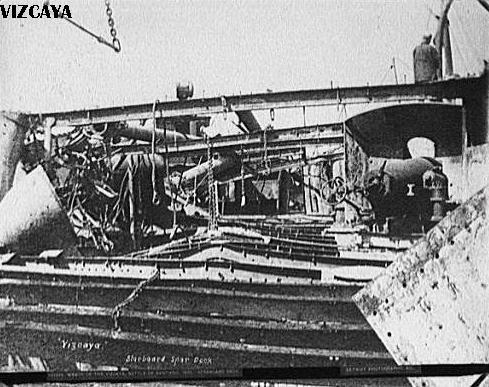 Broadside view of Vizcaya's hulk, from the starboard side, aft. The destruction is evident even from a good distance away, with nothing but the funnels left standing above decks, and the entire hull blackened by fire. 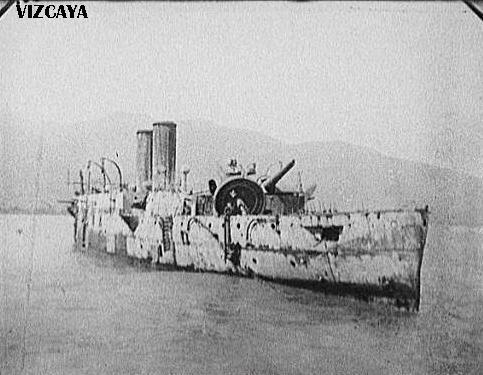 Port side view of Vizcaya's hulk from astern. A fallen mast rests across the aft 11" turret. 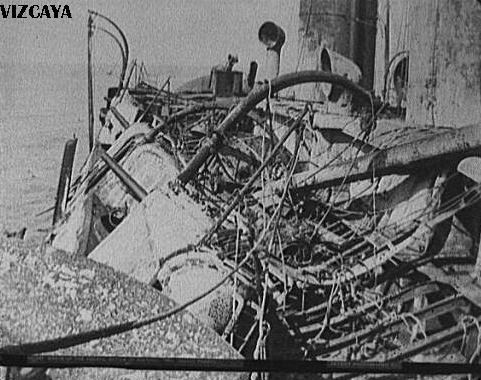 Onboard view of Vizcaya's ruined decks and demolished superstructure. The deck is entirely burned away, the secondary guns ruined, and the superstructure flattened. Another onboard view, showing the general destruction of the ship. The secondary batteries have been completely smashed in. Vizcaya's after 11 inch gun following the battle. Her fallen mainmast lies across the turret. 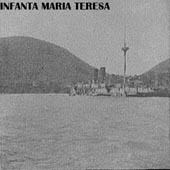 Infanta Maria Teresa prior to the war. 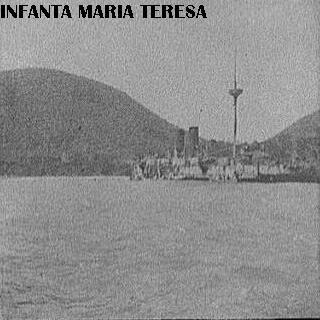 Infanta Maria Teresa in April 1898, not long before her destruction. 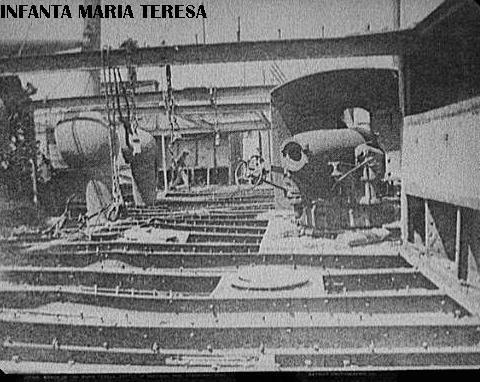 Port side view of Infanta Maria Teresa's hulk. Her funnels and one mast are still standing, but little else remains. 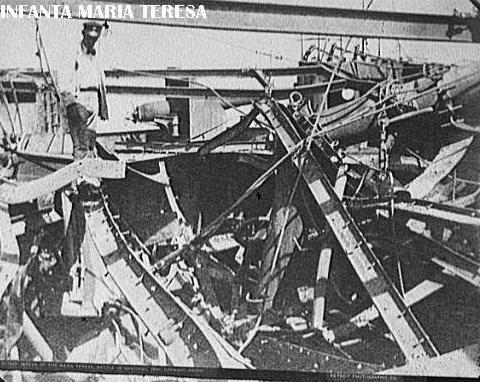 Wreckage of Infanta Maria Teresa's bridge. The starboard side spar deck. As in her sistership, the deck is entirely burned away. 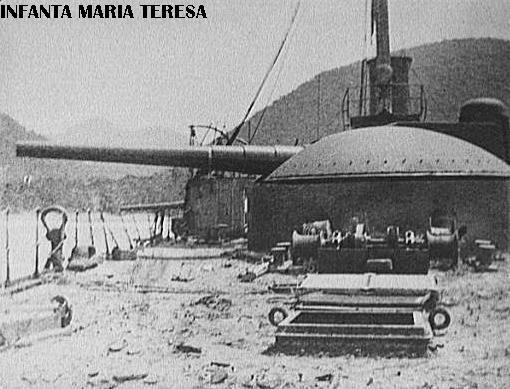 Teresa's after 11 inch gun turret. Amazingly, the US Navy salvaged this shattered hulk, and tried to tow the ship back to the US - but she went around in the Bahamas and was lost. 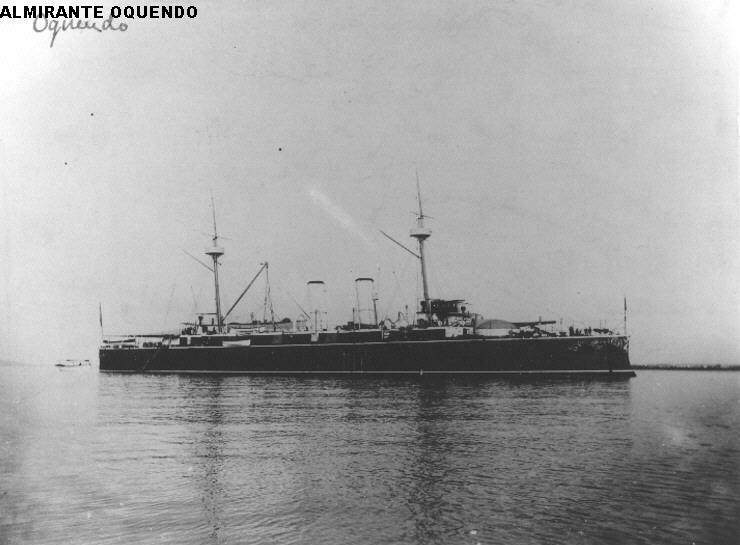 Almirante Oquendo prior to the war. 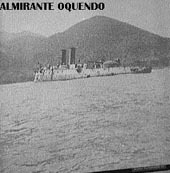 The wreck of Almirante Oquendo. Cristobal Colon prior to the war, with laundry hung out to dry. 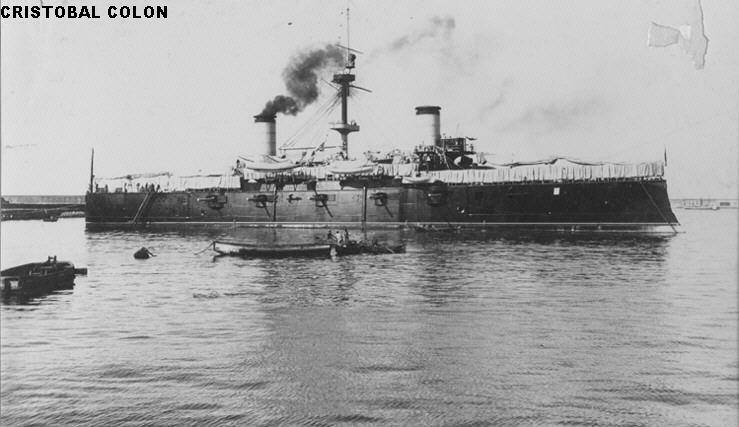 Spain acquired this ship from Italy in 1897, but her 10 inch guns were never installed, leaving her nearly defenseless. 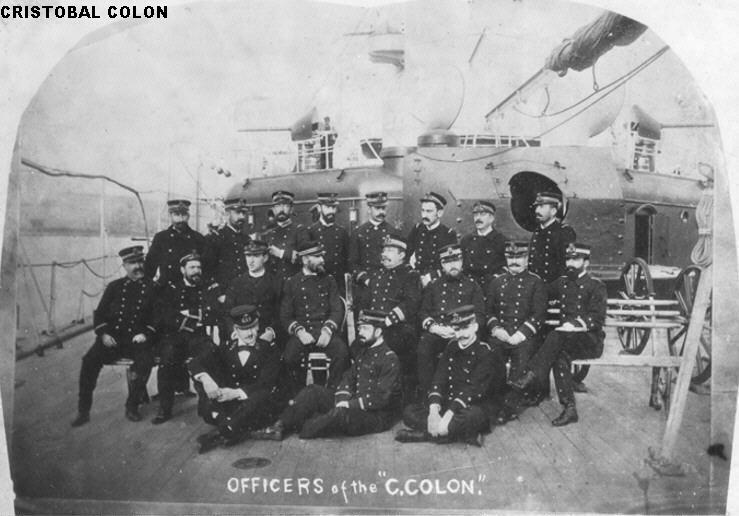 The officers of Cristobal Colon prior to the war. One of the ship's empty 10" gun mountings appears behind the officers. 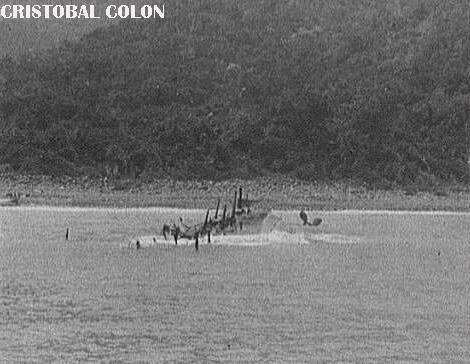 The wreck of Cristobal Colon. Reina Mercedes early in her career. 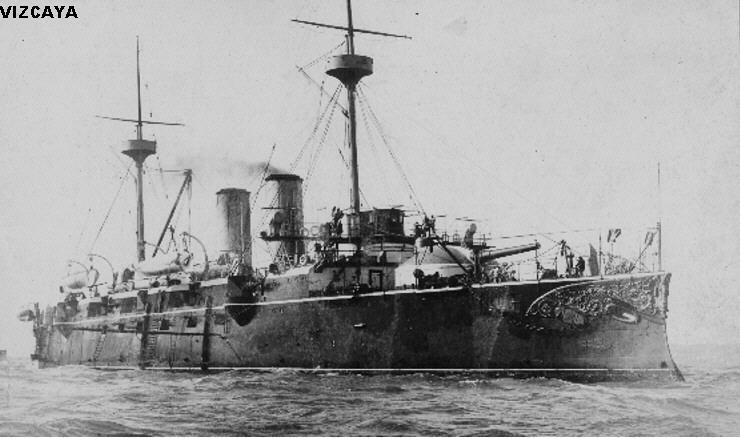 This old cruiser was completely obsolete by 1898, and she played no active part in the war. 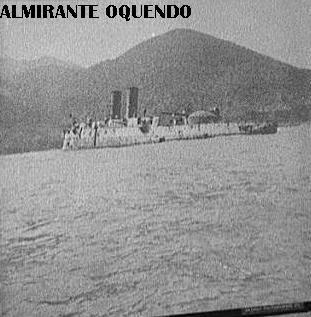 Some of her guns were removed and used for shore defenses, and she was scuttled as a blockship at Santiago. 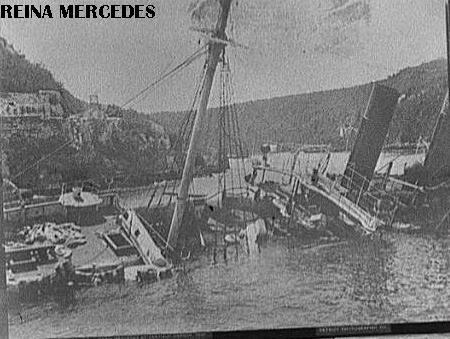 Reina Mercedes scuttled in the channel. 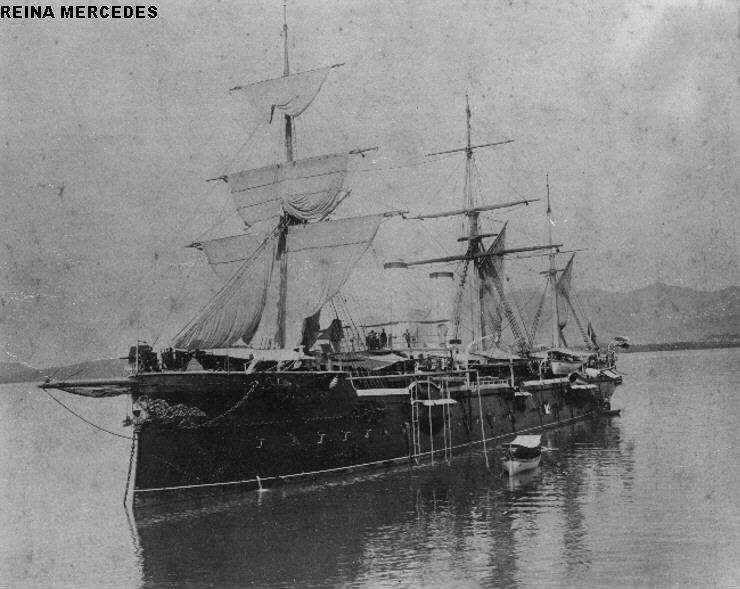 She was raised by the US Navy on 1 March 1899, then repaired and rebuilt in the US. She served as a receiving ship after 1902, mainly at Newport and Annapolis. By the 1950's she was serving as a residence for the commander of the Naval Academy. In 1957 it was deemed too expensive to maintain the ancient ship, and she was stricken and scrapped.